Detroit, MICHIGAN —-A Liberian born and American trained security specialist and special investigator in the Washington D.C. Metro Area, Garretson Al Smith, has received the Martin Luther King Jr Humanitarian and Leadership Award during the World Conference of Mayors held in Detroit, Michigan on October 26, 2017. 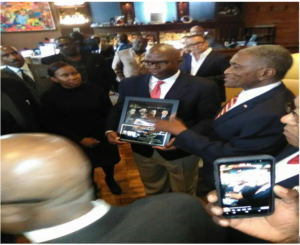 The award was presented recently to Smith by the founding president of the Mayors’ conference, former Tuskegee Mayor Johnny Ford, and the current president of the World Conference of Mayors, Ed Jones, who is also the current Mayor of Grambling, Louisiana. In attendance at the global mayors’ conference were more than four hundred mayors from the world, including those from the United States, Canada, Africa and Asia. Others in attendance included the Canadian Consul General Sebastian Roy, the Africa Union ambassador accredited to Washington DC, Her Excellency Dr. Arikana Chihbori Qauo and other members of the Diplomatic Community as well as global business executives. The World Conference of Mayors was held in Detroit, Michigan from October 23 – 29, 2017. Investigator Smith was invited to the conference by Detroit City Mayor Mike Duggan to do a presentation on human rights and related issues, including investigations into war crimes and crimes against humanity. Speaking on the theme “We Are Ahead of Perpetrators In The International Legal System,” during what is described as the ‘Law Enforcement Night’ at the Conference, Smith addressed a gathering of several state attorneys-general from across the United States on the challenges and possibilities in ensuring international justice. Smith, who is a former member of the K- For Kosovo Forces and the Multi-National Battle Group East NATO International Security Mission in the Balkans under the auspices of the United States Department of Defense, informed the audience at the conference about the need for peace and reconciliation around the world within the context of international justice. Smith is a well respected security specialist and a well-regarded international special investigator. He has served as a former Contractor Staffer at the United States Department of Justice, the United States Department of Homeland Security, The White House Visitors Center, and the International Monetary Funds among others. Smith is believed to be the first Liberian and one of few Africans to received the Martin Luther King Jr. Humanitarian and Leadership Award at the Mayors’ Conference.